2. What Happened To Us? 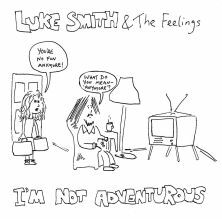 One of two extended EPs recorded between the winter of 2008 and the summer of 2009, this brief and bracing burst of wistful domestica sees Luke reveling in the joys of an honest relationship; celebrating his own apparent boringness; lamenting a rift with a close friend; and pining after an enigmatic love interest; amongst other weighty issues. Bearded Canterbury pianist Luke Smith is the world's most insecure troubadour. Happily he's of the self-effacing Brit variety rather than from the Californian music-as-therapy school, thus his songs of love, bemusement and mild disappointment are both poignant and amusing. Half Ray Davis, half wistful music hall turn, Smith is at his best on "I'm Not Adventurous", a sister song to his classic ode to staying in, "I Don't Want To Go To Parties Anymore", and there's another gem in the hopeless, lovelorn "This Is All I've Got To Work With". With three albums under his belt, it's time the world discovered this very English secret. Oh and I can be myself with you. I can be myself with you and that’s enough for me. Is it my own fault or is it your fault? Can’t we be adult? Can’t we adult? Like you want me to be. When she comes in the pub is she looking for me? And when I leave how bothered is she? Of the prize, though my eyes are tired and oh, the search is long. But I’ve got love to spur me on. But I don’t despair and I won’t give in. When I catch her eye, does it last? Or does she hold it? And she simply controlled it? My love’s still intact. It never ceased.